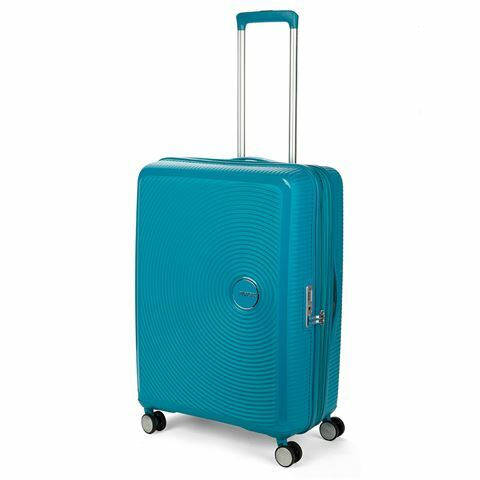 With its eye-catching concentric circle design, the Curio collection is American Tourister’s most stylish range to date. Boasting a tough polypropylene shell, each Curio case features an expandable design, allowing you to increase your packing space in seconds. With four double-spinner wheels and an extendable trolley handle, Curio is the perfect choice for your next long-haul flight. "Rippled" concentric circle design on outer shell reduces the appearance of scuffs. Lightweight, adjustable aluminum trolley handle lets you move around airports in total comfort. Large zippered mesh pocket on the zippered curtain as well an additional small zippered pocket. Comes with a white drawstring storage cover. External Dimensions: 49cm (l) x 69cm (h) x 29/32cm (w).